The Sorrento Bay Swim is a major fundraising activity for the Sorrento Surf Life Saving Club. The 2019 event will be the 16th year of the Bay Swim, and we will again be offering the popular 4000m swim with the 2000m and 600m swim making up the program on the day. Check out the starting times and locations and course layouts for your preferred event and register now! 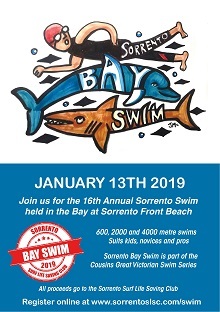 New for 2019, we will return to the popular January date PLUS an all NEW 2000m Course Layout from Sullivans Bay to The Baths Jetty on Sorrento Foreshore. With entries expected to be around 700 swimmers, and catering for both elite athletes and novices of all ages, we are planning to deliver our best event yet in 2019. Sorrento and its beaches are one of the major tourist destinations in Victoria. The Surf Life Saving Club provides a valuable community service with a well-patrolled beach environment for locals and visitors to Sorrento back beach. 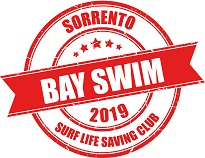 This bay swim event assists Sorrento Surf Life Saving Club with its endeavors to keep our beach safe and provide the youth of the area with a Surf Awareness program to learn surf safety through our excellent junior surf program. The swim also assists to fund raise for important safety equipment such as rescue boards and inflatable rescue boats. Entry fees for 2019 are $40 for 600m and $70 for the 2000 & 4000m swims, and a discounted Entry Fee of $130 available for those wishing to compete in both the 2,000m & 4,000m swims on the day (early-bird discount available). Established in 1870 on the Mornington Peninsula, Ritchies have donated over $47million to local clubs, schools and charities during the last 25 years. Please support the store that supports our community.